I have been writing a series over on Homes.com entitled “How to Update Your Kitchen on a Budget”. My original plan was to only write a two part series (in case you missed them, here are the links for part 1 and part 2.) However, last week I received a few emails asking advice on how to update tired kitchen counters. 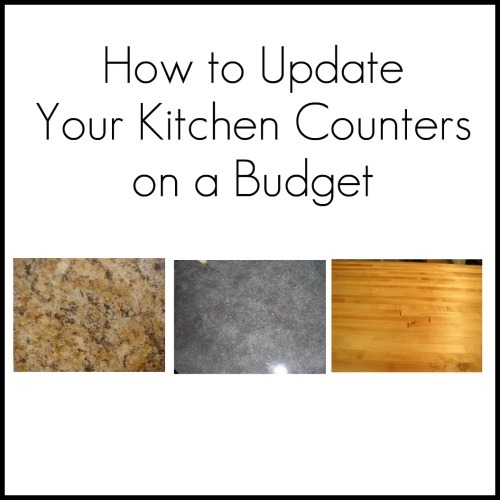 Well never fear, today we are going to explore several ways to update your kitchen counters on a budget! 1. Paint your countertops. Can you really paint old laminate countertops? Absolutely! You can buy prefabricated kits at any home improvement store that will take you step by step through the process, or you can buy the individual paints and products separately. Creative Kristi provides a fantastic video tutorial on how to paint your counters to resemble granite using simple acrylic craft paints and a high gloss sealer. Don’t they look amazingly similar to the real deal? This is an incredibly affordable option that any beginning DIY’er can accomplish and Kristi will show you how! 2. Make Your Counters out of Concrete Okay, granted this option is not for the DIY beginner, but concrete countertops are affordable, durable, customizable, and can be”DIY’ed”! Imperfectly Polished offers a step-by-step tutorial on how she and her husband created these gorgeous concrete countertops pictured below. Kelly Moore also shows you how she and her husband created these beautiful concrete counters. Again, this option isn’t for everyone but if you are adventurous and on a tight budget this might be the perfect solution for you! 3. Install Your Own Butcher Block Countertops Butcher block countertops are a hot trend right now and can give your kitchen a warm cottage feel. They are relatively inexpensive and can be installed by the savvy homeowner. Tip: Many DIY’ers have found that Ikea presently offers the most affordable butcher block countertops available. Triangle Honeymoon shares a comprehensive post on installing Ikea butcher block counters from start to finish. Their finished product is lovely! This & That also offers tips on how to cut out a hole for your under mount sink in this tutorial. And Stillwater Story shares how to achieve a rich, stained finish to your butcher block counters. 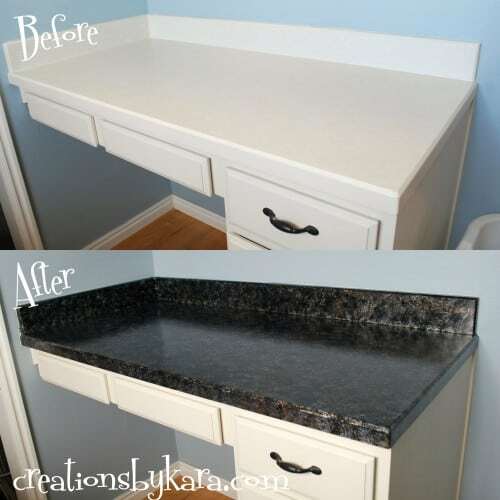 Whether you have $17 or $1700, there is an affordable option for you to update your kitchen countertops! Paint, concrete, and wood are all readily available choices for those willing to try their hand at something new. I hope this series has given you the resources, courage, and inspiration needed to implement some improvements to your kitchen in the near future! If you’ve tried your hand at any of these improvements, or hope to soon, please let me know! I’d love to hear about it. Love your site! So glad to see I’m not the only one using paint to transform my kitchen. 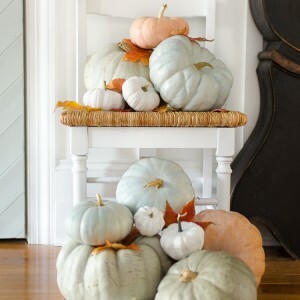 Thanks for posting all of these wonderful decorating tips! While I was at Lowes I saw this countertop kit by Rust-oleum for $250. Here! It had all the coats you needed and of course step by step. The examples in the store look amazing! I stumbled upon your site and it’s fabulous. I just love the ideas you have going on here. Thanks for creating it. Hi Beth! Thank you for sharing my countertops again! You are awesome! Thanks for sharing my laundry countertop Beth! It was fun to see all the other projects too. 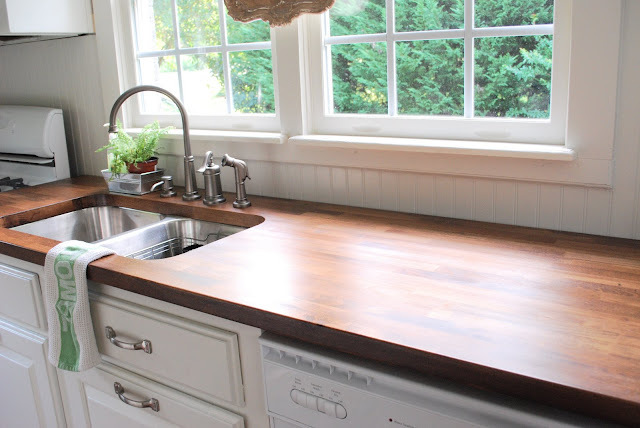 That stained butcher block counter is gorgeous! I have pinned this one as well. Great ideas, I have a counter in my laundry room that I would love to try one of these one. I would love to have butcher block counters. I wish there was a way to do something with my bad choice in granite. I chose a very dark green. Although, it’s beautiful ~ it is so much work. Every crumb shows up and now I’m trying to keep the hard water spots at bay behind the faucet. I absolutely love concrete counters! I’ve been trying to talk my guy into letting me paint the kitchen cabinets and install concrete counters. Maybe these pics & tutorials will help me change his mind! Thanks!